Britain First is a small far-right political movement founded by ex-British National Party (BNP) activist Jim Dowson in 2011. While having some similarities with the BNP and EDL, is more confrontational and militaristic, and places much more importance on the role of Christianity in its ideology. In April 2013, Britain First’s hierarchy launched another political party called Protestant Coalition in Northern Ireland, with Dowson as leader and Golding as treasurer. Branded as an ‘anti-politics, political party' and joined by prominent loyalist campaigner Willie Frazer, the party, however, claimed to have 'no political ambitions'. Britain First and Protestant Coalition they reportedly fell out in September 2013. Britain First claims it is committed to the maintenance and strengthening of the British Union while simultaneously recognising and celebrating the individual identities and cultures of England, Scotland, Wales and Northern Ireland. It insists on 'sovereignty' as all-important and for that reason supports the 'Brexit' camp. It specifically stresses the need to ensure the preservation of Britain’s ancestral ethnic and cultural heritage, its traditions (including Christianity, seen as forming the foundation of British society and culture, customs and values, including the revitalisation of traditional British industries such as agriculture and fishing. They call for an immediate halt to immigration in order to safeguard the existence and lineage of the indigenous British people. 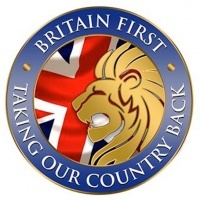 Britain First claims to be both patriotic political party and a street defence organisation. It is conscious that it is filling the void left by the BNP and EDL and employs the strategies and ideologies of both groups. It states that the ‘fightback’ against the 'Islamification' of Britain needs to be pursued and that they are the ‘frontline resistance’ committed to it. With such a militaristic approach, it is unsurprising to see that their actions are increasingly confrontational and direct, an approach which not only seeks to be intimidating but also highly provocative. Britain First cultivates a clear and direct militaristic tone and ethos. It also has a Facebook page where it boasts 1,482,999 likes as of September 2016. On September 8th Paul Golding is investigated over a suspected High Court injunction breach. Activists filmed themselves entering an Islamic centre accused of being home to a 'radical' Imam in Cardiff on January 20, and the leader was reportedly present during this action. In November 2016, Welsh police said they would take Golding to court following the incident. In January 2016 Golding was found guilty of harassment of a Muslim woman and of wearing a political uniform signifying an association with a political organisation. Paul Golding, - chairman. Former head of publicity for the BNP. Currently on trial in January 2018 for charges of religiously-aggravated harassment. Jayda Fransen - deputy leader since March 2016  Currently on trial in January 2018 for charges of religiously-aggravated harassment. ↑ Britain First, Hope Not Hate, accessed 18 January 2014. ↑ Oli Smith, Britain First founder joins Bulgarian militia to hunt down and attack Muslim refugees, Express, 31 October 2016. Accessed 07 November 2016. ↑ May Bulman, Britain First should be listed as a terrorist organisation, suggests Labour MP, The Independent, November 25 2016. Accessed November 29 2016. ↑ British Resistance, website, access date ? ↑ 6.0 6.1 6.2 6.3 6.4 Chris Allen, “Britain First: The ‘Frontline Resistance’ to the Islamification of Britain.” The Political Quarterly 85, no. 3 (July 1, 2014): 354–61. ↑ C. Young, ‘- 'Union flag protesters launch new party’, The Belfast Telegraph, 24 April 2013. Accessed 13 September 2016. ↑ Dowson dumped, Hope Not Hate, 6 September 2013. ↑ ‘regions/S15000001 Scotland: Vote 2014’, BBC News, 16 June 2014, Accessed 13 September 2016. ↑ news/politics/eu-regions/W08000001 Wales: Vote 2014, BBC News, 16 June 2014, Accessed 13 September 2016. ↑ Britain First Videos, 'ARREST ANJEM CHOUDARY, OR WE WILL!' 11 June 2013. Accessed 13 September 2016. ↑ ‘- Electoral Commission issues grovelling apology after extremist party, Britain First, uses Lee Rigby slogan’, Huffington Post, 26 April 2014. Accessed 13 September 2016. ↑ Britain First | Statement of Principles, Britain First, accessed 18 September 2016. ↑ Britain First | Mission Statement, Britain First, accessed 18 September 2016. ↑ Adam Withnall, '- Britain First 'Christian Patrols' return to east London in wake of Charlie Hebdo shootings' The Independent, 19 January 2015. Accessed 13 September 2016. ↑ Lizzie Dearden, '- Britain First 'battalion' invades mosque demanding removal of 'sexist' entrance signs' The Independent, 15 July 2014. Accessed 16 September 2016. ↑ Britain First | Videos, Britain First, accessed 13 September 2016. ↑ Paul Wright, '- Britain First banned from Luton and all mosques in England and Wales after police High Court victory', International Business Times, August 16, 2016. Last Accessed 08 September 2016. ↑ Paul Wright, '- Britain First leader investigated over Cardiff 'mosque invasion' and suspected High Court injunction breach' International Business Times, September 8, 2016. Last Accessed 13 September 2016. ↑ Paul Wright, Fresh crisis for Britain First as police take leader Paul Golding to court over Cardiff mosque row], International Business Times, 02 November 2016. Accessed 03 November 2016. ↑ Former Britain First leader Paul Golding jailed for breaching mosque ban, RT News, December 16 2016. Accessed December 20 2016. ↑ Keiligh Baker,Deputy leader of far-right group Britain First 'hurled abuse at a Muslim woman for wearing a hijab while brandishing a white cross in front of her four young children', Mail Online, 02 November 2016. Accessed 03 November 2016. ↑ People, Britain First, accessed 18 January 2013. ↑ Britain First's Twitter account reported that its website was offline 'for some unexplained reason' that even its technical team were 'struggling to explain' shortly after it launched a video on 'Christian Patrols' on 2/3 February 2014. This page was last modified on 1 February 2018, at 04:26.